Have questions? We’ve got answers. What do you want to know more about? What is the Manulife Heart & Stroke Ride for Heart? It’s Canada's largest charity cycling event in support of heart disease and stroke research. And it’s a fun and rewarding experience of a lifetime! You get to ride, run, walk along the Don Valley Parkway (DVP) and Gardiner Expressway in Toronto, traffic-free with 15,000 other people. In 2016, for the first time, we added a run/walk so even more people can get the “Ride” experience. And it worked! The run/walk is back again this year. When is the Manulife Heart & Stroke Ride for Heart? Whether you are riding, running or walking, the events starts at Exhibition Place in downtown Toronto. Will the Ride take place if it rains? Yes! Rain or shine, the riding, running and walking portions of the event take place. Will riders/runners/walkers all be on the road at the same time? I want to help, but don’t want to ride, run or walk. What can I do? Here are a few ways you can be part of the Ride for Heart and help ensure critical research continues. Donate to the Ride.With a general donation, you help ensure we continue the life-saving work that creates more survivors and brings more Canadians home. Donate to the Ride.With a general donation, you help ensure we continue the life-saving work that creates more survivors and brings more Canadians home. Sponsor a Participant or Team.You’ll make someone smile while contributing to our critical work. Volunteer.You’ll be an important part of the Ride and help the event run smoothly. No matter how you choose to get involved, we need and appreciate your help. Thank you! Then follow the on screen prompts through the registration process by providing your details, checking the box on the waiver, reviewing your info and making a payment (if there is one). You’re done! You can register online until the event is full, or until 11:59 p.m. on June 2, 2018, whichever comes first. Can I register as an individual, group or team? You can register as an individual, group or Corporate Challenge team. Individuals are single participants who are excited to raise funds for the Heart & Stroke Foundation and participate in the Ride for Heart. Groups are 2 or more people who will be raising funds and riding or striding together. So if you’re riding, running or walking with at least 1 other person (such as a friend, co-worker, group or club members) choose the group option when registering. The Corporate Challenge is a day of team building, morale boosting, profile raising, and lifesaving for businesses that want their employees to have an extra special event day experience. Corporate Challenge teams can be made up of riders, runners and walkers. Can’t I register the day of the event? Yes you can — as long as it’s not sold out! The Ride has sold out for the last 5 years, so secure your spot in advance by registering online. Plus, all participants (18+) have to raise a minimum of $100, so registering in advance gives you lots of time to reach that goal. I’ve already registered for Ride for Heart 2018. When do I receive a registration confirmation? Thanks for joining us! You should receive a confirmation email right away to the email address that you provided when registering. There’s a chance it went into your spam folder (or promotions tab if you use Gmail), so be sure to check there. As event day approaches, our team will send you helpful emails from time to time. Keep an eye out for them! If you haven’t received a confirmation email yet, please use this contact form and let us know. Will I get a tax receipt for my registration fee? No, but you will receive a tax receipt for all your donations. Registration fees help offset the costs of putting on this exceptional event so, in accordance with Canada Revenue Agency (CRA) regulations, they do not qualify for charitable tax receipts. I would like to ride or stride with my husband/sister/child/friend. Do I have to register everyone separately? Yes. It’s the only way to secure a place in the event for each participant. Each person simply has to complete a registration form and sign an event waiver. If a participant is less than 18 years old, a parent (or custodian) will have to sign the waiver on the child's behalf. Thank you so much for encouraging others to join you. It’s going to be an amazing day! Register now. Is it possible to change a registered Group or Team name? Yes, your Captain can make this change in their participant centre. Does my online profile show me who my teammates are? Simply log in to your fundraising page, and then click on the “my team” link. Why are Individual and Group registration fees identical? All adult individual participants will incur the same registration fee. The advantage of joining a group is that you can monitor your team stats together. I would like my company to have a team. How do I sign up? Thank you so much! Simply contact the Corporate Challenge Coordinator at corporatechallenge@hsf.on.ca or 416-489-7111 x3277. We’ll happily get your team set up and we’ll be here to support you along the way. The company I work for has signed up. How do I register as part of their team? That’s great! You’ll just need to know your team name and your team’s discount code, to ensure you are not charged for joining your team. You can ask your team captain if you aren’t sure. Select the correct participant type to join a Corporate Challenge Team from the list. Provide your details and enter the discount code to waive the registration fee. Tick the box on the waiver. Do I have to fundraise in addition to paying a registration fee? Or does my registration fee count towards my fundraising goal? Why? Yes, each participant (18+) must raise a minimum of $100 outside of their registration fee to be able to participate. Participants must raise the minimum fundraising amount by event day. Here are great tips on how to reach your fundraising goal. Keep in mind that if you’d like to be a VIP you must raise at least $1,000. Whatever your goal, you can do it! First, log in to your Participant Centre. From there, you can send emails to your friends and family. You’ll find recruitment, donation request and thank you email templates that will link directly back to your personal donation page. How do I collect offline donations/pledges? Your supporters can donate using cash, cheques or credit card. Simply download the download the fundraising form and use it to record your sponsors’ information. Once you’re finished fundraising, you can submit the offline donations/pledges a couple of ways. Visit a Heart & Stroke Foundation Office near you. During pre-event check-in or at the Ride. Do I need to enter the offline donations I have collected in my online participant centre? How will my fundraising thermometer reflect these funds raised? You are not able to enter offline donations through your Participant Centre. Your offline fundraising amounts will appear on your fundraising thermometer within 2 business days of us receiving your funds and fundraising forms. This will ensure that your fundraising totals are as up to date as possible and minimize discrepancies. Alternatively, you may personally deliver your offline funds and fundraising forms to our Check-in Centre. Do not send cash in the mail. Please note: any offline donations received at the Check-in Centre or Ride Day will not be added to your fundraising thermometer total but will count towards your fundraising total and prizes. How will you use the money that I raise? The dollars you raise help fund critical research. See how we put donated dollars to work. Does each member of a Team need to raise $100? Or is it a combined total? Each person on your Team needs to raise at least $100. If there are kids (Participants 17 years of age or under) on your team, they don’t have to raise $100 but of course, we’ll be so happy if they do! Check out our fundraising tips. Get started by donating to your own fundraising page. It’ll set the bar and bring you that much closer! Yes. Everyone who participates in the ride must wear a helmet, regardless of age or experience. The safety of all participants is of paramount importance to the Heart & Stroke Foundation. We want you to have a spectacular, safe and memorable Ride. Toronto Police will be onsite to help ensure the safety of participants and enforce all legislation regarding the mandatory wearing of bicycle helmets. There will be no exceptions. What are the route distances for the run/walk? You can choose to either participate in a 10K run or a 5K run or a 5K walk. I’m a past rider and I’m worried about this new run/walk. What will it mean for riders like me? The Ride for Heart is unchanged by the new event. Your event day routine including start times and routes are exactly as before. The run and walk take place on the eastbound Gardiner only after all riders have finished that portion of their ride. You may see some runners going East on the Gardiner as you are coming home towards Exhibition Place. The events are separate and connected by the desire among participants to create more survivors. Can I ride and then walk or run? You can choose to either ride OR run OR walk at the Ride for Heart. When you register for the event, you will be asked to choose one of these options. What is the route of the run/walk? Are there aid stations along the way? Yes! They will be positioned at the 5km turnaround, the 10km turnaround and a water station will be available just beyond the finish line. Will the run/walk be timed? Yes, timing services will be provided by SportStats. Runners and Walkers will be timed by way of bib tags attached to their bibs. Bibs are distributed through mail for participants that have raised $100 online by May 1 or in-person at the Check-in Centre on event day. Do not remove the chip from the bib. Do not fold the bib or excessively bend or twist the chip. Wear bib on chest/abdomen, with a chip attached to it. The chip will be will used to recognize participants as they cross the finish line, but will also have the added benefit of timing your run or walk. While we are not a competitive event, this is an added benefit to your experience with the Ride for Heart. Is there a course cut-off time? Don’t fret! We expect most walkers/runners will have no problem finishing the route in this time. All runners/walkers will need to complete the route by 12:30pm at the latest. If you have not completed the course by this time, then you will be picked up and shuttled back to the finish line where you will be able to enjoy Heart Park. What are the course conditions? The paved course is mostly flat, with the exception of the on-ramp to the Gardiner Expressway eastbound start line. This is a 180 degree arcing right turn on a slightly downhill on-ramp, so all participants must take the necessary precautions to ensure their own personal safety and the safety of others while on this ramp. Participants will use this same ramp, going uphill, to exit the course. After crossing the Finish Line, participants go back up the on-ramp and follow a dedicated chute to the finish area. General participants can visit the Outdoor Food Market and then to Heart Park, and Corporate and VIP participants will head towards Heart Park and their space within the Enercare Centre. What about participants in wheelchairs? Wheelchair access is available specifically on the 5km Walk. The paved 5km Walk route is mostly flat, with the exception of the on-ramp to the eastbound Gardiner Expressway start line. This is a 180 degree arcing right turn on a slightly downhill on-ramp, so participants must take the necessary precautions to ensure their own personal safety and the safety of others while on this ramp. A wheelchair accessible vehicle will be available along the route for those who may require assistance or are unable to complete the event by 12:30 pm. Participants with an accompanying stroller may register specifically for the 5km walk route only. 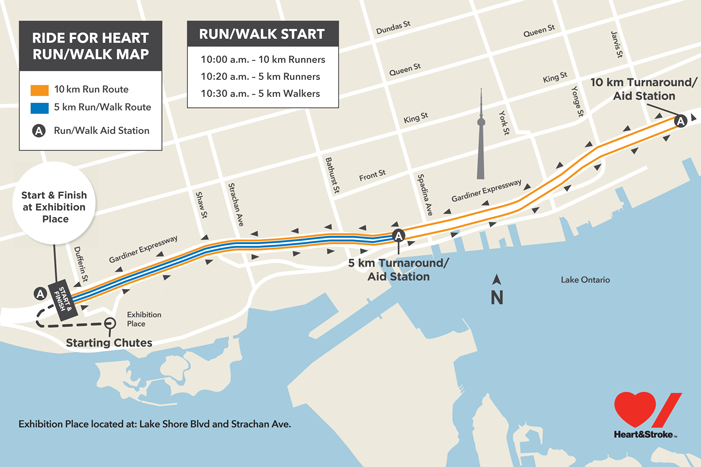 The paved 5km Walk route is mostly flat, with the exception of the on-ramp to the eastbound Gardiner Expressway start line. This is a 180 degree arcing right turn on a slightly downhill on-ramp, so participants must take the necessary precautions to ensure their own personal safety and the safety of others while on this ramp. All participants will start the 5km walk at 10:30am. A vehicle will be available along the route for participants that require assistance or do not complete the event by 12:30 pm. Are there bag check services? Yes, there is bag check is available. Enter through Heart Park and look for the signs which will direct you to bag check. A bag with a drawstring will be included in the Participant Packages for runners and walkers and is sized so that all bags checked will fit in the bag check areas, ensuring efficiency at both check-in and pick-up. These bags must be used to check-in belongings no other bags will be accepted. It is strongly recommended that valuables be left at home. The Heart and Stroke Foundation is not responsible for lost or stolen property, including any and all property checked in the Bag Check areas. Is it possible to complete the run or walk as a VIP? Absolutely, if you choose to become a VIP runner or walker and raise $1,000 or more, you will receive all of the same VIP benefits that a VIP rider does, except you will receive a technical running shirt instead of a cycling jersey. I am part of a corporate team, what does the run/walk mean to me? The great thing about the addition of the run/walk is that even more people can get involved in helping to create more survivors. Teams and groups can be made up of riders, runners and walkers. Teams will not be split up by based on how they chose to stay active and support the Foundation. We think this is an opportunity to build a bigger, stronger, more inclusive team event where you can choose how you want to participate. Will I receive the same fundraising incentives as a runner/walker? Yes, the same great fundraising incentives are available to you as a rider, runner or walker at the same fundraising levels.